FRONT ROW, FROM LEFT: David Burkhardt - Mattituck, Derek Medolla - Jericho, Mark Romanowski - South Side, Scott DeBenedittis - Syosset (Nassau Player of the Year), Mark Jecewiz - St. Anthony's, Kyle Poetzsch - Hicksville, Ever Torres - Brentwood. BACK ROW, FROM LEFT: Brett Waxer - Syosset Head Coach, Johnathan Interiano - Brentwood, Blake Bohlen - Port Jefferson, Kevin Mercadante - Chaminade, Jeff Medina - Brentwood (Newsday Player of the Year), Tyler Kirschner - Half Hollow Hills East, Brendan Reardon - St. Anthony's, Brian McPartland - Hicksville and Ron Eden - Brentwood Head Coach. Meet the 2012 All-Long Island boys soccer team, as selected by Newsday's Adam Ronis, in alphabetical order. A big reason Brentwood played three defenders this season instead of the usual four is Medina. The Indians could count on Medina to cover any breakdowns, and he anchored a stout defense that allowed eight goals in 23 games. 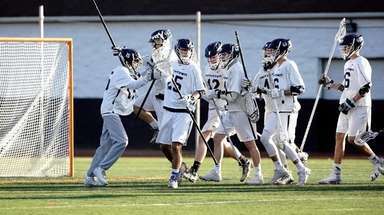 The defense allowed just three goals in seven postseason games en route to their fifth consecutive Suffolk Class AA championship. The Stony Brook-bound Medina was an All-American and the state Class AA Player of the Year. Led Braves to their first Nassau Class AA championship since 1998, recording 13 goals and 14 assists. He was one of the keys to the playoff run with three goals and three assists in the postseason. Already a two-year team captain as a junior and a three-year starter, DeBenedittis controlled the midfield and was the key in setting up the offense. He also defended the opposing team’s top midfielder. Helped bring the 21-0 Royals their second consecutive state Class C championship with 33 goals and 14 assists. Bohlen scored the winning goal in the Southeast Regional final and in a pair of 1-0 wins in the state semifinal and championship game. Burkhardt had 24 goals and nine assists, including three goals and two assists in the Southeast Regional final. Interiano scored in the Suffolk Class AA final, had the lone goal in the LI game and scored in the state semifinals. The All-American had nine goals and 10 assists for a team that went 22-1, reached the state final and was ranked No. 2 in the country entering that game. He will play at Albany. One of the best defenders on Long Island, he was critical in helping St. Anthony’s go unbeaten in league play and reach the CHSAA championship game. Jecewiz led a defense that allowed just eight goals in 20 games with many games coming against top-notch competition. Kirschner led the Thunderbirds to the Suffolk Class AA finals and scored in a 2-1 overtime loss to Brentwood. He had 19 goals and six assists. He will play at Buffalo. Recorded eight shutouts against Nassau’s toughest competition. A four-year starter, McPartland finished his career as Hicksville’s winningest player with a 61-5-7 record. He recorded 38 shutouts and 597 saves. He will play for Hofstra next year. 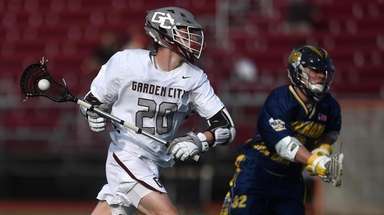 He helped lead Jericho to its second straight state Class A championship with 11 goals and four assists during the regular season and seven goals in the postseason. Medolla scored 11 game-winning goals and had a point in all but three games. Mercadante is good in the air on both sides of the ball, is an excellent passer and dangerous on set paces. 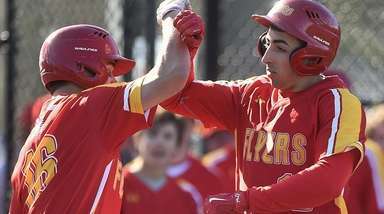 He had three goals and three assists and was the CHSAA co-league MVP as he helped Chaminade win the CHSAA championship for the second time in three seasons. 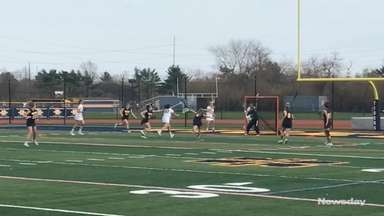 One of the most dangerous players in Nassau, Poetzsch led the county with 22 goals during the regular season and scored two more in the playoffs. He scored a single-game career-high four goals twice this season. Poetzsch will be playing for Hofstra next year. Reardon was co-MVP of the CHSAA and led the league in scoring with 13 goals. He also added eight assists. Reardon scored in the CHSAA championship game and also scored when the game went to penalty kicks. Constantly man-marked the opposing team’s best player while playing centerback. He won most of the balls in the air to gain possession for the Cyclones and set up their offense. Romanowski, an All-American, had 10 goals and 13 assists in his career. 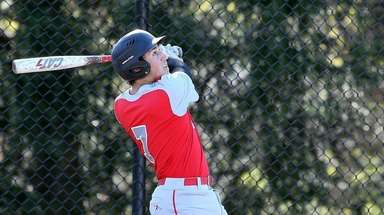 A four-year starter and two-year captain, Romanowski won county championships as a freshman and sophomore and played in three county finals during his career. One of the most explosive players on the Island. Torres is a playmaker that is a threat to break down a defense any time he has the ball. He had the winning assist in a 2-1 overtime win over Half Hollow Hills East in the Suffolk Class AA final. Torres played through injuries all season and had 19 goals and 18 assists.